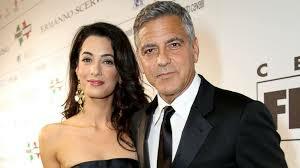 George Clooney and Amal Alamuddin were wed Saturday, Hollywood Insight has confirmed. “George Clooney and Amal Alamuddin were married today (Sept. 27) in a private ceremony in Venice, Italy,” the actor’s publicist told Hollywood Insight in a statement. The pair was wed at the Aman Canal Grande resort by Clooney’s pal Walter Veltroni, the former mayor of Rome. A number of celebrities were on hand for the nuptials, including Matt Damon, Bill Murray, Bono and Anna Wintour. Many of the guests arrived at the ceremony in taxi boats. News of the 52-year-old actor’s engagement to British lawyer Alamuddin first broke in April. They obtained their marriage license in August. This is the longtime bachelor’s second marriage. He was previously married to actress Talia Balsam for four years until their divorce in 1993.